Today, I want to introduce a couple of pen cases from a french company called Atelier De LaForêt (http://www.atelier-de-la-foret.fr – the content is in french language, only). Obviously, apart from pen cases and stationary, this company manufactures a big range of leather items, but this is something you can check out yourself. I will focus here on pen pouches (»etui à stylos«). Pen pouches in smooth finish: “mandarin”, “whiskey” as well as in grainy finsish: black. The difference in the roughness of the leather is quite visible. As you can see from the title image, I will deal with the cases made for two pens. Cases for single but also for three pens are available. 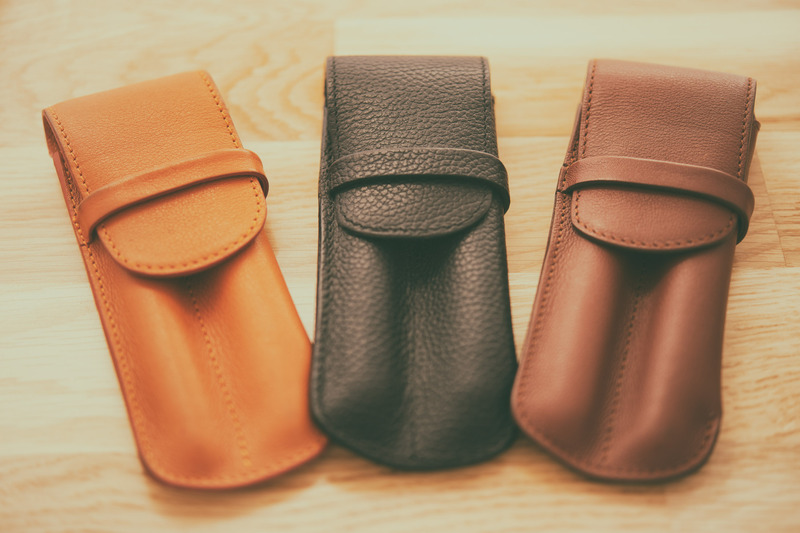 Basically the pouches come in different colours but also in two leather-types: a soft finish and a more grainy (or coarser) finish. The colour spectrum for the soft finish is a light green (»kiwi«), brown (»whiskey«), blue (»lagoon«), orange (»mandarin«), a deep tomato like red (»rosso«) and a white (»blanc«). the more grainy versions come in black, »whiskey«, darker red and a khaki-shade (no white, no orange). The colour names like »whiskey« I grabbed from the shop I bought them (the weiting desk, a uk based shop). A couple of years ago I purchased two cases with soft finish (»whiskey« and »mandarin«) and a black one with the grainy finish. I think, there is no need to describe them in deeper detail, because it is anyway a matter of taste. The provided pictures should tell you the whole story. I will provide a little comment in the summary section, though. There is one thing however, which needs a description and this is how the leather feels. Well, the soft ones feel just … soft :-). the grainy ones show the same thickness, but the leather is may be a bit more matt but most of all much stiffer than their counterparts. The overall manufacturing is well done, the joints are stable and show a constant distance to the edges – very robust they are. Manufacturing of the pen cases (here the orange/”mandarin” as an example). The displayed ones are already four years in use. Not heavy use, though. It turns out, that the particular right compartments (view from top) are slightly bigger in diameter and can take bigger pens. Both ones are able to take bigger pens such as the the Edison Collier, Meisterstück 149 or the Lamy Safari/Al-Star with their quite girthy caps. By the way, sliding pens with a ball-shaped clip (the abovementioned Edison Collier or Noodler Flex Pen) into the pouch is much more difficult then for those pens with clips shaped like those from Pelikan Souverän or Lamy Safari. Accordingly, the pouches wear off at this particular spot after while of use. Well, it is anyway the case, that these pouches wear off after a while of usage. they are robust but the colour gets stained, the leather gets a bit more shiny – very normal, I would say. But as mentioned, the joints are not affected at all! And signs of abrasion are only there where the mechanical load is strongest (where the clips moving over and over on the leather). But of course, this is something which depends strongly upon how they are used. And the most important thing is anyway, that the the pens are save in the pouch! And this is the case! The pouches are quite robust, but on spots with strongest mechanical usage, they show abrasion marks – see also next pic. Due to the thickness of the leather (2-3mm), some pens with “improper” shaped clip-ends, do not slip very comfortable into the pouch. Clips with a spherical shape are most prone to this – solution is to lift the clip manually and push it into the pouch. Best experience I made with Pelikan (Souverän), Lamy Safari/Al-Star, Lamy 2000, Platinum, or Sailor (of course I only talk about pens I have access to …). Intensive usage lead to abrasion marks. The Atelier DeLaForêt pen cases are in any case one thing: robust! I do not find them very elegant in shape (not at all). They have the »aura« of something robust and looking good enough at the same time. The are nice to the touch. And actually, the typical leather smell persists up to now (after four years of usage). I like it! Well, ok, the smell is not too chemical or so. But of course, I cannot describe this properly. What I also like is the colours. In particular the »mandarin« is very bright and beautiful. But of course, since this one is the brightest (I own) it takes over patina most visibly. Would I buy them again or would I buy one in another colour? I guess I would! The pouch in »lagoon« colour, I would like to check out, actually. But may be not the white one, because the way I handle them, they could abstain to keep on being pretty for a longer time … Also, I would not purchase again those with the more stiff and grainy structure, because these ones are just too stiff for my taste. They are looking more robust (without do being much more robust) but I do not dare to put an elegant fountain pen into them – that does somehow not fit esthetically. But again, that’s only me. Thank you for this helpful review. I have one of the De Laforet triple pen cases in red. I think the compartments may be slightly smaller than in the two pen cases but it is suitable for medium size fountain pens. The right hznd slot (which has stitches on only one side not two) is slightly more roomy and will just about accommodate a Montegrappa Fortuna but is tight. Very nice leather and well made. Oh, yes. I have seen your one on a picture in one of your blogs from last month. Looks good. Actually, I always think my reviews are a bit too negative because I point the flaws a bit too much out. However, I am mostly very satisfied with the pen pockets.